This is a stunning necklace, hands-down a unique piece. Starting off with the pendant; it is hand-formed and stamped out of .999 Pure Silver by Laura. It is then gold plated along the outside edges. 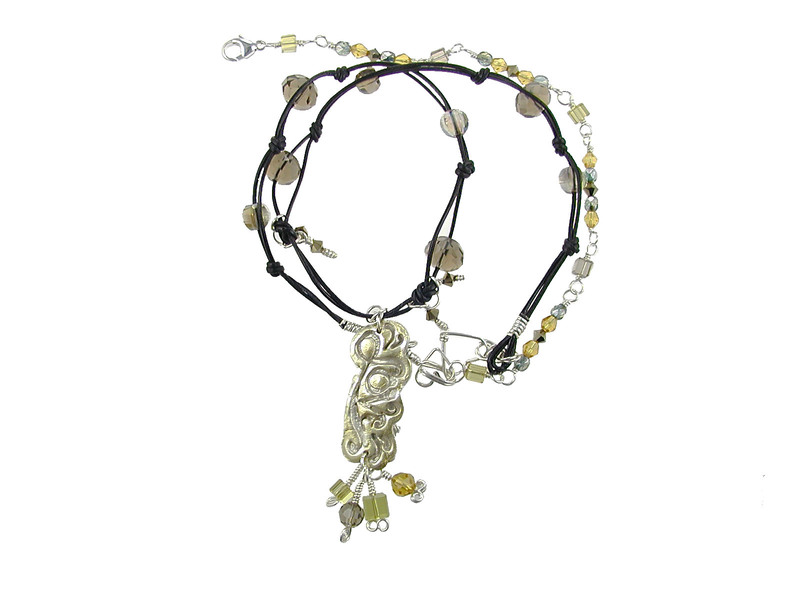 There are smoky quartz-crystals on knotted leather cording. The multi-colored Chinese crystals, and crystal squares are affixed to a hand-made chain, which allows the necklace to have adjustable capabilities. This was a fun necklace to make since I got to make the centerpiece by hand. The centerpiece is .999 Pure Silver with 5 special fire-resistant crystals. 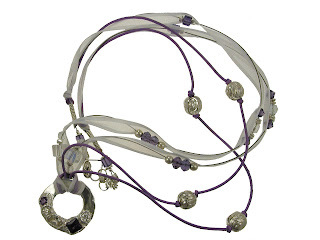 This pendant is noosed in purple silk thread and light purple ribbon. Pearls and crystals are threaded throughout the light purple ribbon, so it looks as if they were floating, as well as to give support to the ribbon so that it stays stiff. If you would like a piece similar to this, or need something unique for a special occasion, contact us! 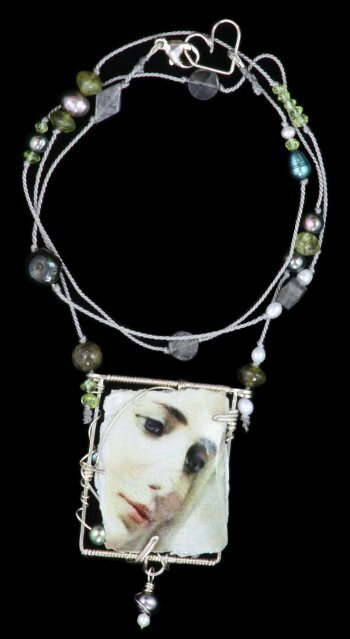 This piece was specially made for the ADVOKATE fundraiser a few years ago. Kate Hrischuk had a brain tumor and died at the age of 6. Everyone was praying and raising funds for Kate's survival. The Hrischuk familiy, and the Avondale School District, started ADVOKATE throughout the schools. 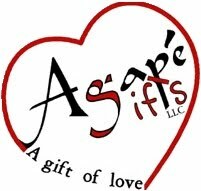 Agape Gifts then partnered with ADVOKATE and was able to raise over $1,200 for their medical bills. This special piece here was made for the mother as gift of love from AG. The crown in the center of the bracelet represents the soul of "Princess Kate". Agape Gifts also specially made about 30 polymer pins with meaningful signs and words representing Kate and ADVOKATE long with special rosaries. Pray for us Princess Kate! As a Post-Note, we have just realized that today is Princess Kate's Ressurection Day. Thank You Holy Spirit! This inspiring bracelet was specially made for a cancer survivor. 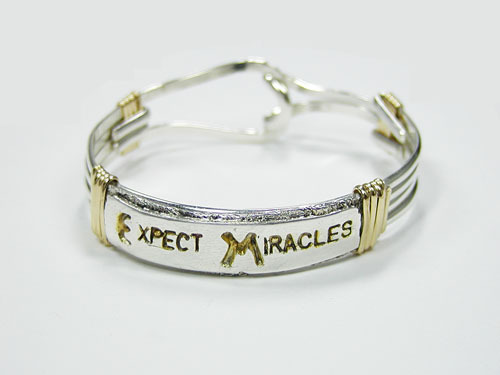 The meaning “Expect Miracles” was to help the individual gain strength through all her chemotherapy treatments. The center piece was hand crafted and stamped out of .999 Pure Silver. Each of the letters were then hand-plated with 24-karat gold leafing. The pure silver has been carefully polished and buffered so that it shines like a mirror, and can reflect the individual’s image. If you would like to order a similar bracelet, or need an individualistic piece of jewelry contact Agape Gifts! This was a fun, yet time consuming bracelet to make. Each of the silver rectangles were hand-made from a .999 silver clay. Laura shaped, embossed and plated each silver bar individually. The recessed areas of the silver bars are plated with 22-karat gold. 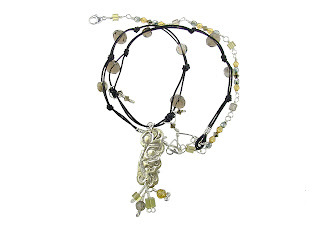 The bronzed cultured pearls add a great color to match the gold inside the silver pieces. Then a collection of Swarovski crystals are individually attached to give an added sense of ‘bling’. 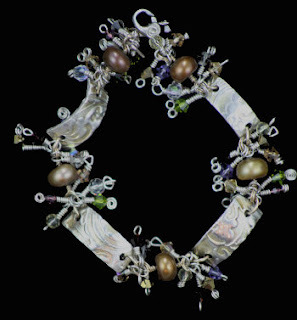 This was an amazing piece and almost everyone commented on it, but this bracelet now has a great owner! If you would like a piece similar to this one, or any special art-ware, please contact Agape Gifts! This bracelet was initially designed to be sold at the Detroit Institute of Arts Gifts store, however an interested buyer decided he wanted instead. 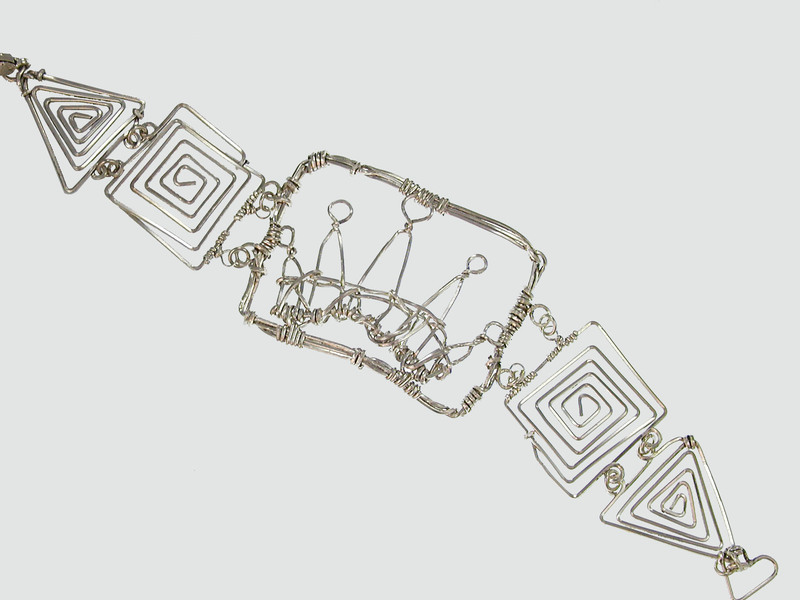 The bracelet is made from hand-knited .999 fine silver wire. 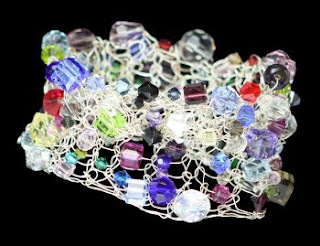 Knitted into the wire are 200 one-of-a-kind crystals. This bracelet is no longer available, but if you would like to have a similar bracelet, or would like more information - just let us know! Here is a recently made piece with creative imaging and silk cord. In the center of the necklace is a custom-printed image of Our Lady. The image has been transferred onto a flat shell with custom wire work around the pendant. On the hand knotted silk are pearls and labradorites. Here is a pair of earrings that I just finished last night. There are ruby quartz on the bottom with custom-designed silver wire on the top. 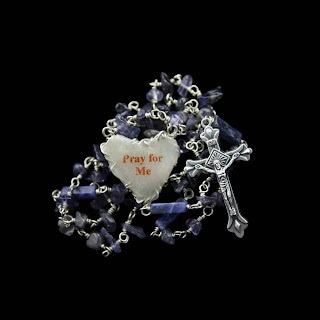 When we were approached by a nun to make a specialty rosary, we got a great idea. We have since made rosaries with patron saint(s) on them. See the picture below. These rosaries do not have specialty Our Father beads, just a patron Saint center. Here is another Wedding Rosary. This Rosary was made for the couple on the day of thier wedding made from pictures taken during thier engagement. 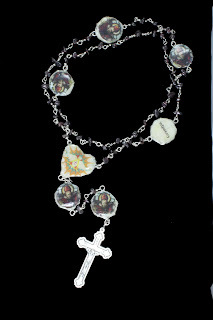 Part 2 of the Most Beautiful Rosary Bracelet EVER! Since Grandma was having hip surgery, the family was not sure if she would make it for the confirmation, so she had a proxy. I was inspired to make a finger rosary for the proxy. I made a matching finger rosary with St. Nicholas image, garnet stones and the Confirmation event information. In the end, the Grandpa was so happy to have part of the commemorative made just for him. This rosary has wonderful multiple stories attached to it, but we will first reveal the story about the rosary bracelet. This is actually a sponsor gift of thanksgiving. The family approached me to make a confirmation rosary for their sons; still bating on what to give the sponsor, his grandmother. I suggested a rosary bracelet at the time, but the idea was dismissed to be pondered further, everything is in God’s time. 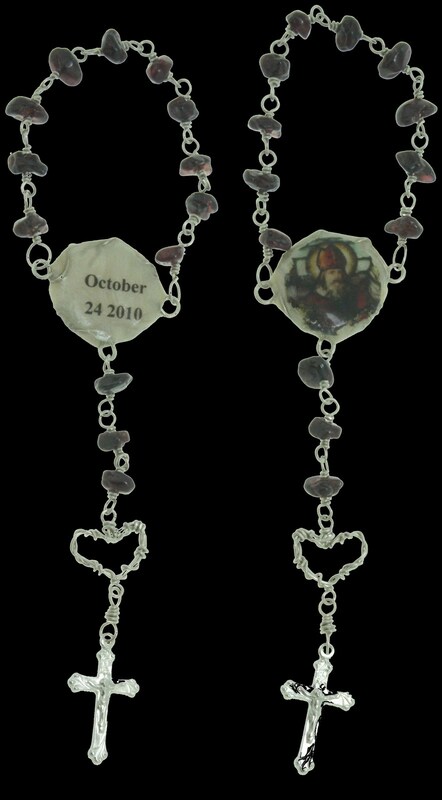 As the confirmation date approached, we re-visited the need for a sponsor gift and as our conversation unfolded, we returned to a rosary bracelet with great ideas of mirroring his rosary of garnets and images of St. Nicholas with the date of the event. Unfortunately, I received a phone call stating that grandma had to have hip surgery and may not even be present at the Confirmation Mass thus needing to change some information on the Confirmandi’s rosary (another story) and possibly pick a different sponsor; the decision to keep Grandma as the sponsor and have Grandpa the proxy. As the bracelet was being designed on paper, my daughter had the idea to have their picture on the bracelets, which then lead to having the Confirmandi write a special note to his grandmother; the secret mission was set, excitement is in the air! Neither the Confirmandi nor the Sponsor knew what they were getting but each know what the other was receiving… tricky communications for the mom. 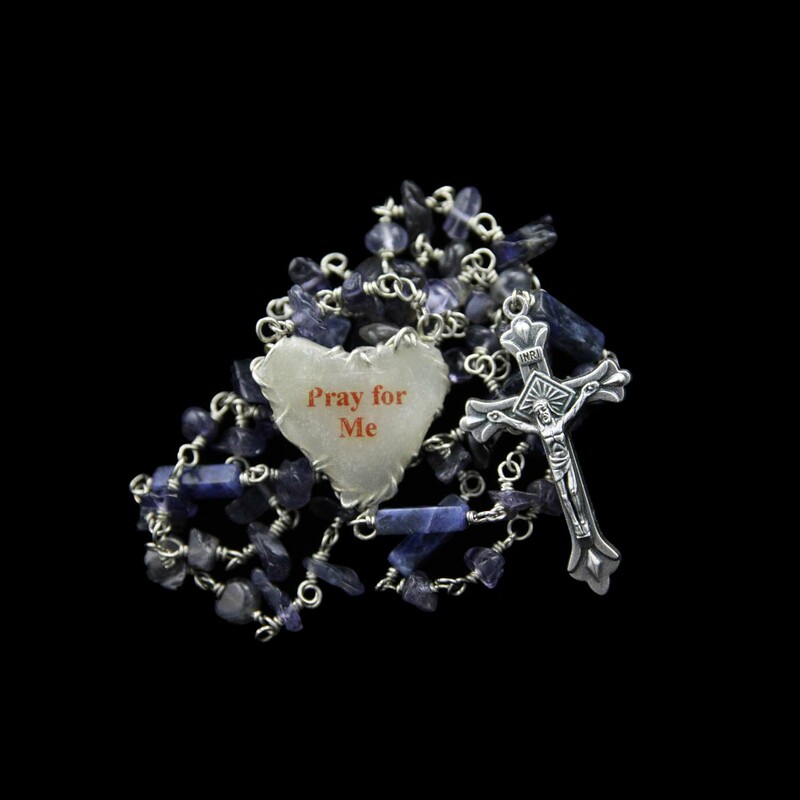 As I finally sat down to work on the actually work on the rosary bracelet, picture and letter in hand, I spent hours praying for the recipient of the bracelet… little did I know that on that exact day Grandma went into the hospital for hip surgery and recovery, unbeknownst to me. What a wonderful feeling to know that our labor of love and prayers helped Grandma get through her surgery AND participate in the confirmation celebration. This Rosary, has less of a story, but we will continue unveiling special order rosaries to show what our new abilities are! This story is about a Wedding Rosary. This wedding rosary is for a couple who has already been together for 18 years - so even if you don't have it for the wedding, they also make great gifts for your spouse on anniversaries. 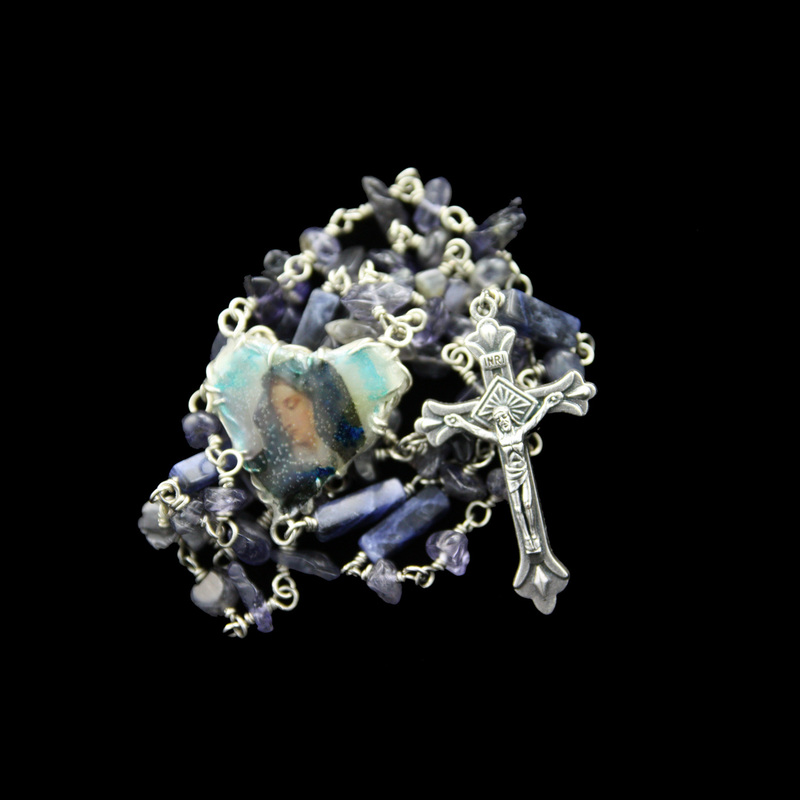 These rosaries will last a life-time carrying the memory of your love for one another. YOU can have a family memorabilia to be passed on for ever. 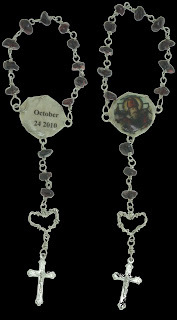 In the rosary below, Agape Gifts used the wedding theme colors for the Hail Mary's; On the Our Father's are pictures of the couples from thier wedding day, and on the opposite side is the couple's monogram. In the center of the rosary is an image of the presiding Pope during thier wedding "blessing" thier marriage. Definitely a priceless item! Thank you to all those who keep up with our blog and facebook. 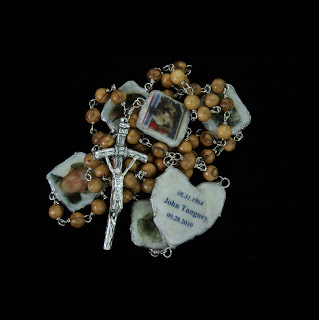 Here is the unique Rememberance Rosary. This Rosary is not like any other rosary because in the centerpeice is a copy of the Loved-One's finger print. On the Our Father Beads is all his occupations, and each of his siblings are on the opposite sides of the Our Father "squares". Even the olive-wood beads are meaningful. Initially our customer had lost an olive wood rosary given to her as a gift from this person, from the Vatican, - so now, she has an olive-wood rosary that he has "touched". 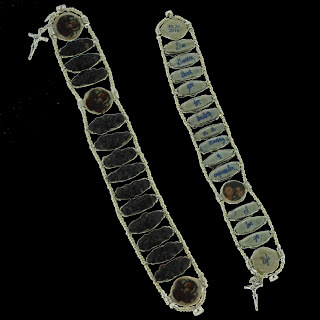 Then, the customer also purchased individual finger-rosaries for each of her loved-one's siblings. The finger rosary had a group picture with the loved one, along with his finger-print on the medallion.